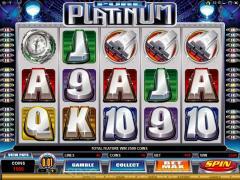 Pure Platinum Microgaming Slot Review - Find Casinos to Play at! Platinum is the most valuable metal and this online slot game seeks to cash in on the value of pure platinum. Everything in the slot game has a lustrous and metallic appearance. The symbols on the reels are typical forms in which platinum is found. There are platinum Bars and Tablets. The platinum Ring and Watch are high value items made from platinum. The high value cards also appear as if cast from platinum and are set in backgrounds of different colors. The wild symbol is the Pure Platinum logo and the scatter symbol is the Platinum Disc. Adding value to the slot game are the 40 paylines, which is more than par for the course. Being a Microgaming online slot game, Pure Platinum offers a wide range of customization options including sound options and game speed control. In the Expert Mode a comprehensive auto play feature is provided. Pure Platinum offers only three coin sizes and that too in the lower end. These are 0.01, 0.02 and 0.05. With maximum possible 10 coins per line the largest line bet is only 0.50. This is not likely to attract high rollers. Because the slot game has 40 paylines the maximum total bet is 20.00, which again is on the lower end. The wild symbol does not multiply payouts but offers the highest fixed jackpot of 1000 credits when five wild symbols appear in an active payline. However, the highlight of the wild symbol is that it appears stacked on the reels, both in normal spins and in free spins. When the stacks appear on the first two reels with all 40 paylines enabled the spin results in huge payouts. When two or more scatter symbols appear anywhere on the reels they result in scatter payouts. Five scatter symbols yield a payout of 100 times the total bet. Three or more scatter symbols anywhere on the reels trigger the free spins feature. Pure Platinum gives players a choice from three free spins options. The first option gives 50 free spins at 1x multiplier. 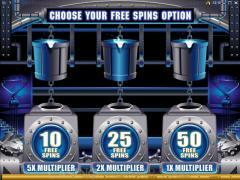 The second option gives 25 free spins at 2x multiplier. 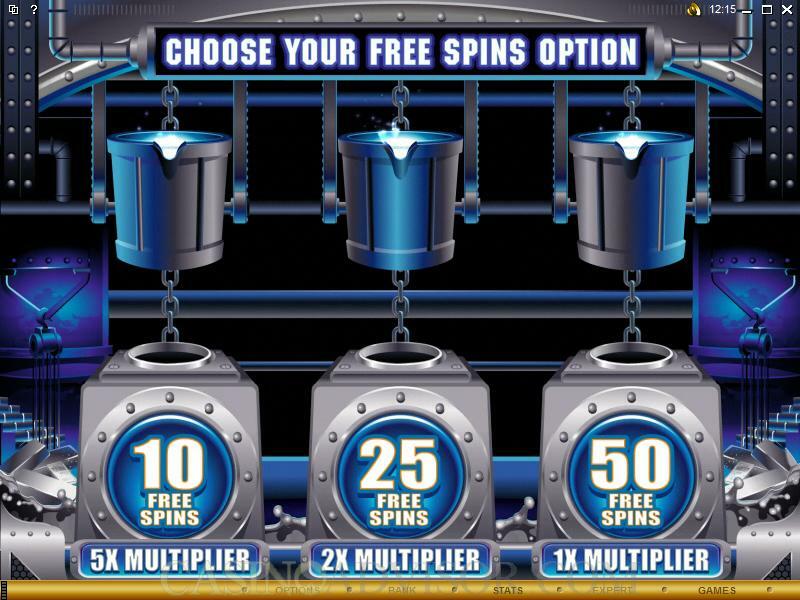 The third option gives 10 free spins at 5x multiplier. Hence the player has to take a call on whether he wants a greater number of free spins or a higher multiplier. The three options are offered as three molds with buckets of liquid platinum above them. After the player makes his selection liquid platinum is poured into the chosen mold. The free spins cannot be retriggered. 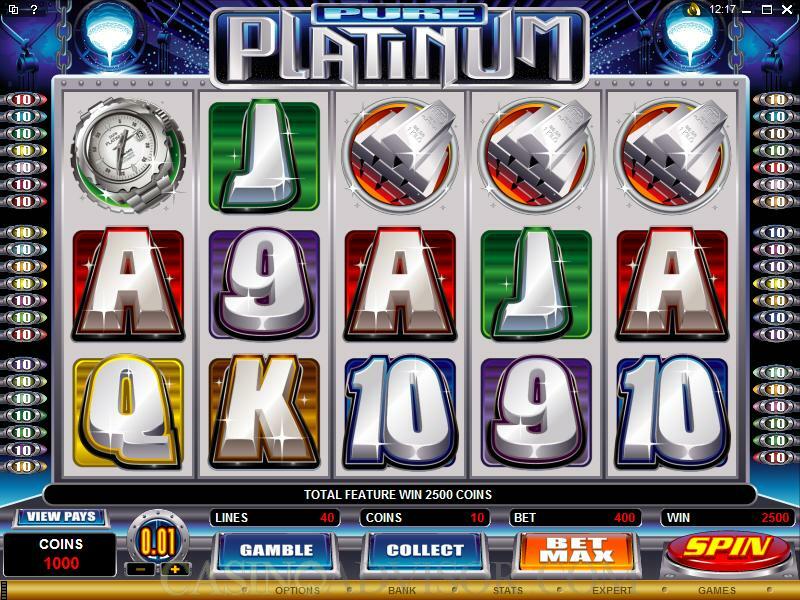 Pure Platinum also offers Microgaming's Gamble Game. Players can try to double or even quadruple each payout until the gamble limit is reached. When the player receives a payout the Gamble and Collect buttons appear below the reels. The player clicks the Gamble button to activate the Gamble Game. He can choose a color to try and double his payout or choose a suit to try and quadruple his payout. Interested in reading more detailed information about Pure Platinum? If so Click Here for more details.